Staff Photo by Dan Henry Dr. R. Smith Murray and his wife Barbara Murray walk along the north side of the Walnut St. Bridge on Wednesday. The city will be closing the bridge for five months to upgrade its asphalt section with wood planks. North Shore merchants aren't too happy about the Walnut Street Bridge closing for five months for repairs, but as long the work is done on time, they can live with it. David Smotherman, president of the Northshore Merchants Collective, said the construction is a business hindrance, but most small business owners understand the pedestrian bridge repairs are needed. "It's always disappointing because it's a vital link," said Mr. Smotherman, owner of Winder Binder Art Gallery and A Novel Idea bookstore. While at first glance the bridge closure might affect holiday shopping, shutting the bridge in the spring likely would hurt more, he said. "Anytime after March is going to hurt," he said. Since the bridge should be closed only two to three months in the spring, compared to the two-and-a-half years it took to renovate the Market Street Bridge, the merchants should be OK, Mr. Smotherman said. The City Council awarded a $1.3 million contract to Tower Construction on Tuesday for the bridge repair work. The contract includes a $45,000 incentive if the company finishes the work a month early. The bridge will be closed starting Dec. 10. City officials chose to close the bridge from December to May because fewer people use the bridge in colder weather. "We've come to a point in its age where it needs to be replaced," said Dennis Malone, assistant city engineer. "The winter is the best time to do this work." The contractors plan to rip up the asphalt that runs along the road on the north side of the bridge and replace it with about 708 feet of timber, Mr. Malone said. The center portion of the bridge and the south side already are made of timbers. Crews will post detour signs directing people to walk or bike across the Market Street Bridge. Jennifer Cobb, who lives at Museum Bluff Condominiums, was walking across the bridge during lunchtime Wednesday. 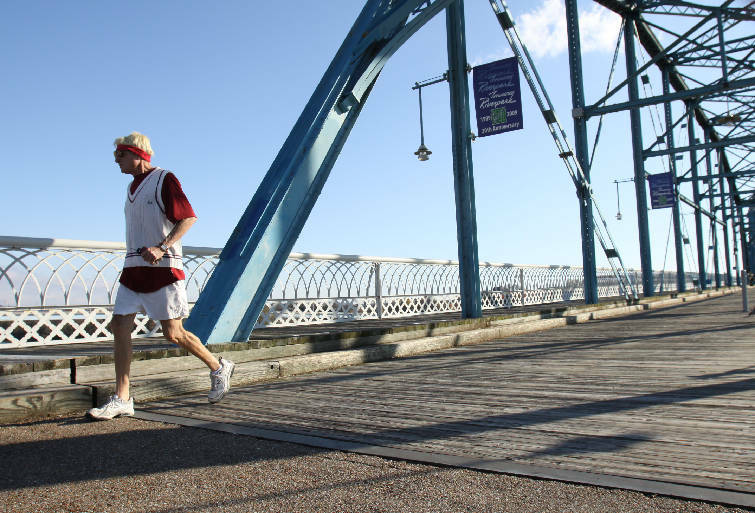 She uses the bridge a couple of times a week, riding her bicycle to Coolidge Park or walking the bridge for exercise. She said she would use Market Street Bridge, but fears it might not be safe because of the sidewalks. "It's not very wide," she said. Robert Byrd, along with his co-workers Kyle Stumpf and Matt Lyons, were walking across the bridge Wednesday on their lunch break. They said they walk the bridge five days a week, unless it rains. The trio said the work would disrupt their lunchtime activity a bit, but they would use Market Street Bridge. Mr. Byrd said he felt a little edgy about walking across that bridge. "I'm always nervous about cars whizzing by," he said.